Gravel riding is hot and it's one of your favorite kinds of riding or you'd like to try "white roads" where you might not see a car all day. Not to mention finishing in St. Peter's Square is too epic to resist! The Route, dirt and paved roads following in the footsteps of ancient pilgrims, was first documented in 990 by Sigeric, Archbishop of Canterbury, in his diary describing the places he passed through as he returned to Canterbury. The roads that Sigeric followed became known as the Via Francigena (the road from France) or “Via Romea” (the road to Rome) and for centuries was used by merchants, clergyman, soldiers, and pilgrims traveling back and forth from the north of Europe to Rome and Jerusalem, carrying ideas as well as money and produce. These people traveled on foot or on mules and horses, and rarely by cart because the conditions of the road varied continually. The road was built and maintained by the local nobles. 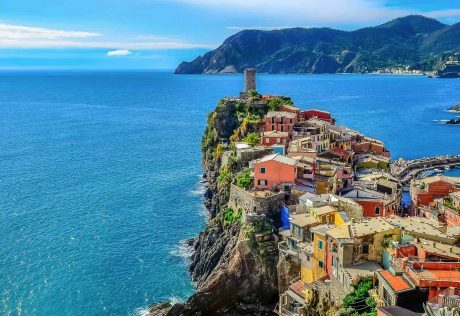 Because it was not constructed with the idea of connecting places of great importance and distance like the Roman roads, it was a series of local paths and trails of various widths and various materials, which linked mountain passes, bridges, ferry boats and villages. Ciao and welcome to Lucca! Today we’ll meet at the hotel at 12 pm for a brief introduction, bike fitting, and a warm-up ride to get you familiar with your bike. Lucca was already an important city at the time of Sigeric as it was the seat of the Duchy. 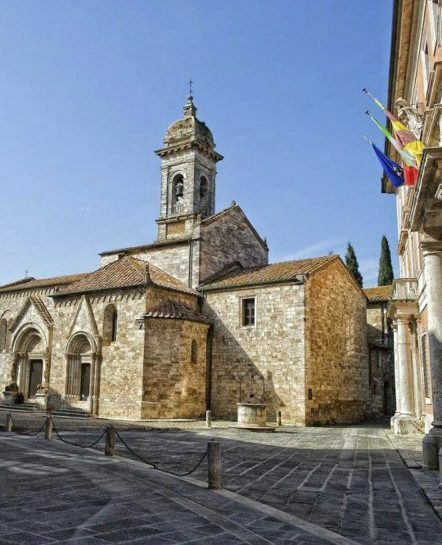 Within the walled city of Lucca, the traveler today can visit many different kinds of museums and churches, particularly the Cathedral where there is a highly venerated crucifix said to show the real face of Christ. 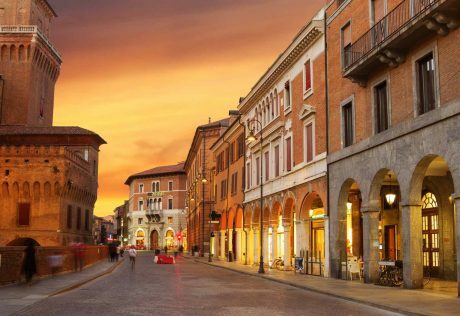 Hotel Ilaria and Residenza dell’Alba is located in the center of Lucca, inside the Renaissance city walls. Approaching to a medieval door and overlooking a park, enjoy the spectacular architectural frame under a majestic plane tree. The hotel was originally the old stable of the Villa Bottini. We’ll have an easy and quite flat start, to Altopascio, village famous for its bread, continuing on, we’ll cross the wild area of Cerbaie and meet some stretches of the ancient way, preserved as it was originally. San Miniato is located in the lower Arno valley, on the south-eastern hills dominating the river plains, halfway between Pisa and Florence. The medieval village of San Miniato is in the center of Tuscany and it preserves a historic center set on the hill top with the Cathedral, the Episcopal Palace, the Municipal Palace and the Tower Fortress dominating all the surrounding Arno, Era, and Egola valleys. Showcasing an outdoor pool and views of the pool, Relais Sassa al Sole is located in San Miniato, just 22 miles from Florence. The resort has a seasonal outdoor pool and views of the garden, and guests can enjoy a meal at the restaurant or a drink at the bar. From San Miniato we descend to the Elsa river valley to Castelfiorentino, (“Castle of Florence”), which was a fundamental part of the war between Florence, Pisa and Siena. Before getting to Gambassi Terme we pass by Pieve a Chianni, a Romanesque church with a breathtaking facade. After lunch we head towards San Gimignano, where we can visit the Sanctuary of Pancole and the enchanting Pieve di Cellole. Entering San Gimignano by bike will be one of the major highlights of the day. Dubbed the “medieval Manhattan” due to its towers, we’ll arrive when it’s the least touristy. We leave San Gimignano and, after some ups and downs, arrive to Poggibonsi and start to climb to Colle Val d’Elsa, the most important Italian town for crystal processing. Continuing on, we reach Gracciano d’Elsa and the little village of Strove, which was built in the 6th-century by the Lombards. Before arriving to Monteriggioni with its unmistakable “crown of towers,” you’ll have the opportunity to see Abbadia a Isola (“abbey on an island”). After lunch we reach Siena, the emblem city of the Via Francigena, to which it owes its wealth and prosperity. You will experience a walk through the Middle Ages as you visit the ancient hospital of Santa Maria della Scala with its frescoed ‘pilgrims’ hall’’. Siena’s unique profile will follow you for several miles, while you ride on the easy paths of the Val d’Arbia. The Via Cassia climbs to the spectacular Quirico d’Orcia, sitting high on a hill with commanding views of the surrounding scenery. At dawn the Tuscan sun shines onto the breathtaking landscapes of the Val d’Orcia, with its rolling hills of yellow wheat or plowed field. We’ll end our day by the square basin of Bagno Vignoni, a thermal spring whose water was a cure-all for medieval pilgrims. This is the hardest day of the trip, with over 1,200 meters of elevation gain. We’ll leave the Val d’Orcia and reach Radicofani, in the lands of Ghino di Tacco, who was a famous outlaw that ruled the mountains at the border between Tuscany and Lazio. Fortunately for us, we’re more likely to meet local shepherds with their sheep dogs, watching the flock that produce the precious “pecorino” cheese. The descent to Bolsena is long and fun, but requires focus to ride with care. The way to Viterbo unfolds in northern Lazio, the area was developed before the Romans by the Etruscan; here we’ll ride by ancient tumuli (burial sites) and using the “vie cave”, roads cut in the soft stones, with a very modern concept; our destination, Viterbo is very pretty city, full of history, where architectural styles melt in an intriguing blend. Today we’ll go by Sutri, Etruscan site who’s amphitheater, fully carved from a soft stone hill, is testimonial of a rich and educated civilization. From there we’ll go to the village of Campagnano, the Monte Gelato waterfalls, and the lovely fresh valley of Rio Sorbo. Formello, our final destination is a lovely medieval village. We will not hurry now that your goal is so near. We’ll cool off in the shady forests in the Veio park, where you’ll find it hard to believe that Rome is so close. Soon the silent Roman countryside must soon give way to the streets and palaces of the city. 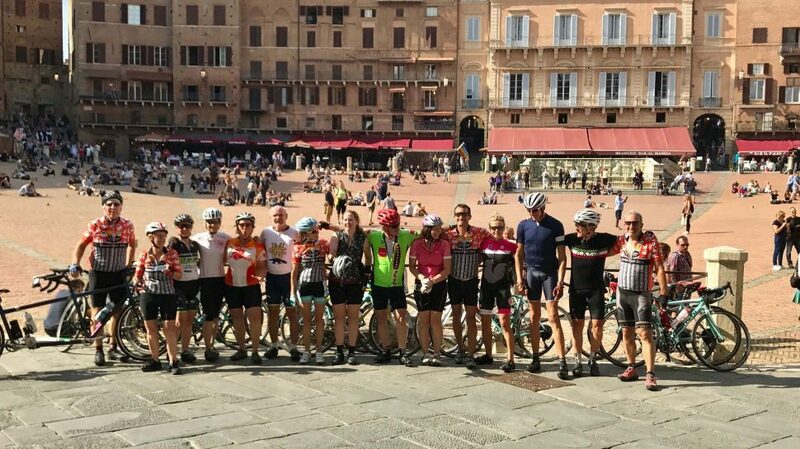 The emotions of the last day, the last short stage, will stay with you forever as you arrive in the Eternal City and are surrounded by the beauty of St. Peter’s Basilica and Bernini’s colonnade embracing you in the last few pedal strokes. After breakfast around 9 am, it’s time to say “arrivederci” to Italia. You can take a taxi or train to Rome Airport to make your connection back home, or extend your stay in Rome and beyond!